It was not until 1928 that British women won the same voting rights as men but it was a major step that put the country ahead of some contemporaries such as France. 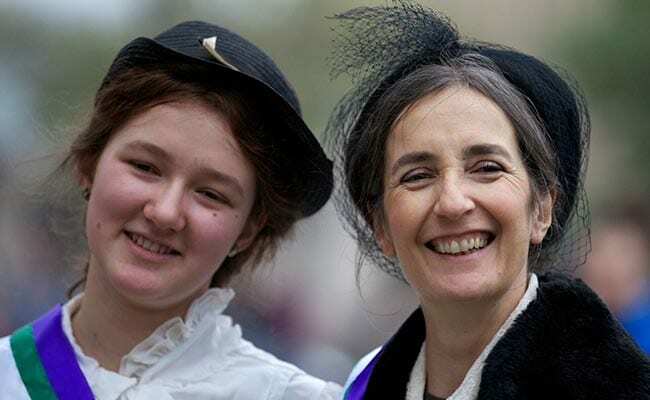 London, United Kingdom: British women won the right to vote 100 years ago after an intense struggle marked by a violent fringe campaign that shocked the country but helped to change the world. On February 6, 1918, the Representation of the People Bill became law and added to the voting roll around eight million women who were aged over 30 and met other conditions. Among those involved in the decades-long British campaign, the Suffragettes stand out for militant acts that were unprecedented in their day, although their influence is still debated. Suffragettes chained themselves to railings, broke shop windows and blew up post boxes as part of their fight. They cut electricity lines, disrupted meetings and even bombed the house of a government minister. It was a deliberate move into militancy preached by the group's founder, Emmeline Pankhurst. In the most shocking act, Suffragette Emily Davison became a martyr to the cause when she was killed throwing herself under the king's horse at the 1913 Derby. She was convinced "one great tragedy ... would put an end to the intolerable torture of women," Pankhurst wrote in her 1914 autobiography "My Own Story". Hundreds of Suffragettes were jailed but they continued their protest in prison by refusing to eat. Many were force fed, a harsh practice that ended in 1913 with legislation that allowed authorities to release hunger-striking women prisoners when they became too weak and re-arrest them when they had recovered. Pankhurst was jailed and released 11 times. Detractors said the actions of the Suffragettes showed that women were emotional and irresponsible and therefore not fit to vote. Some historians credit the role of women in World War I as more important in securing voting rights than militant activism. But in 1999 Time magazine named Pankhurst as one of the 100 most important people of the 20th century. She "shaped an idea of women for our time; she shook society into a new pattern from which there could be no going back," it said. "The militant campaign was absolutely essential to moving the vote forward," Krista Cowman, history professor at the University of Lincoln in Britain, told AFP. "There was 50 years of peaceful campaigning before that really hadn't done anything." When World War I broke out in 1914, Pankhurst called a halt to the militant campaign in support of the government's war effort. Women stepped into crucial jobs vacated by men sent to fight. In a revolution for their role in society, they worked in fields, factories and beyond. "Many of these feminists hoped that patriotic support of the war would enhance the prospects for women's suffrage after the war," according to the historian Joshua Goldstein in "War and Gender". As the war wound down, the first steps towards equal right votes were allowed. "It's very much a start," said Cowman, who was historical advisor to the 2015 film "Suffragette". "There's a whole raft of legislation that comes in Britain in the 1920s that's about improving lives for women, like divorce law reform, equal access to professions." While the Suffragette campaign attracted much publicity, Britain was not the first country to enfranchise women. New Zealand led the way in 1893, followed by Australia in 1902, Finland in 1906 and Norway in 1913. In the period between the start of the two World Wars, women in more than two dozen countries acquired voting rights, including the Soviet Union in 1917, Germany in 1918, the United States in 1920 and Brazil and Thailand in 1934. Other countries lagged, though, including France, whose own Suffragettes -- influenced by their British sisters but without the militancy -- eventually gained the right to vote in 1944. Switzerland took until 1971 and voting remains restricted for women, as well as men, in Gulf Arab countries such as Saudi Arabia and the United Arab Emirates.